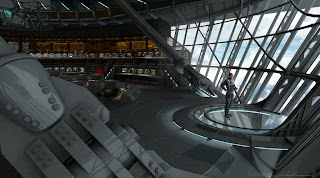 I featured some concept art from The Avenger's Helicarrier before, but one of the main artists who helped bring the S.H.I.E.L.D. 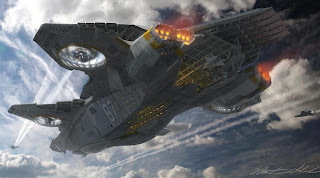 Helicarrier to the screen was Nathan Schroeder (Thor, Star Trek, Captain America: The First Avenger) and I got an exclusive interview with him where he talked about his designs and the challenges of redesigning one of the most iconic vehicles in comic book history. Nathan repeatedly said that there were many talented designers that worked on the S.H.I.E.L.D. 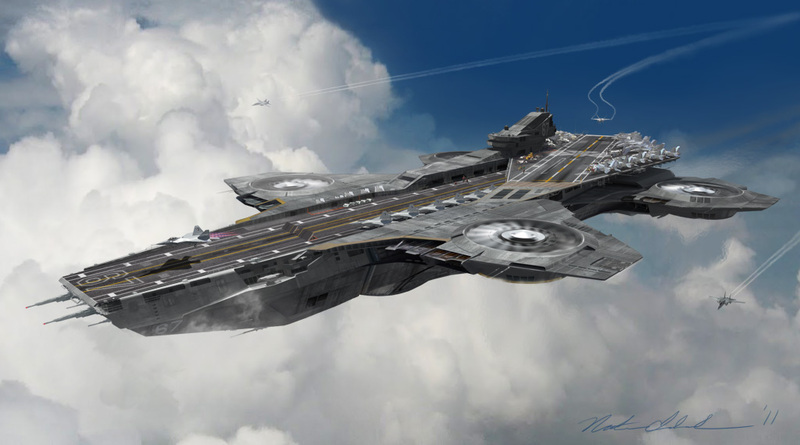 Helicarrier. 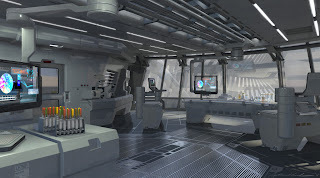 But, James Chinlund, the production designer, said "the key designer on the piece was Nathan Schroeder, who was elbow deep for several months helping to bring the ship to life." I'm sharing some exclusive photos, but you can see more on his site. Here's what Nathan had to say about the designs, the challenges and the one scene that caused them to panic. "I was really happy how it turned out. Joss Whedon did a great job with it." he said. While he didn't work directly with director Joss Whedon, as is typical in the industry, he did work with James Chinlund the production designer. Whedon would talk with Chinlund about elements of the Heli-Carrier that had story implications. Where would the engines be and what would the technology be like? He would need this information to block out the scenes. 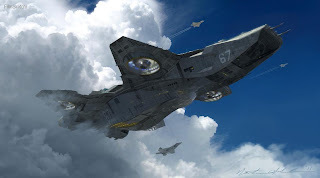 When the designs of the Helicarriers were first done there was a lot of speculation about how to do it. The designers went through many phases from submarines with propellers to flying boats. In the end they went for a more militaristic look inspired by Steve Jung. 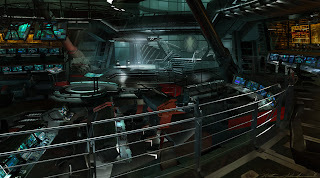 The following are some of Schroeder's concept designs. He didn't get to read the script because of security concerns, but he was given details that he needed. One scene in particular he mentioned was the scene with the lab when Banner "Hulks out" and is attacked by a plane. 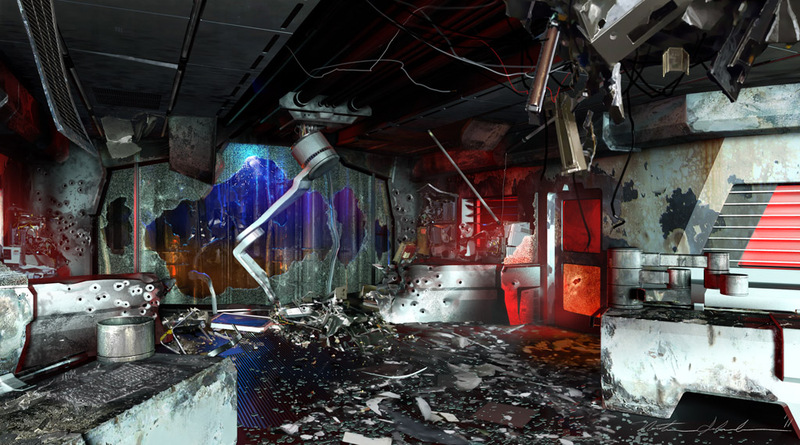 "I had to develop the construction of the lab specifically based on what they needed for this scene." Nathan said. He went as far as having to determine where the stress points were. For example, Whedon wanted to know if the windows blow out or just have bullet-holes in them? 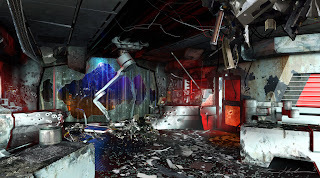 Is the lab completely destroyed and burnt or is it useable afterwards? 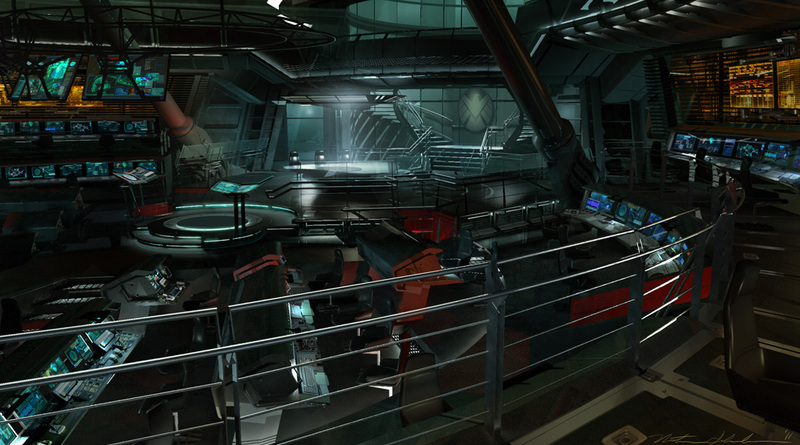 The bridge was a collaborative effort with set designers and artist Steve Jung. Nick Fury could stand in several locations and there was a table that the Avengers could have meetings in. One of the "biggest challenges was the front window," which was a real stage and was a "big engineering job." 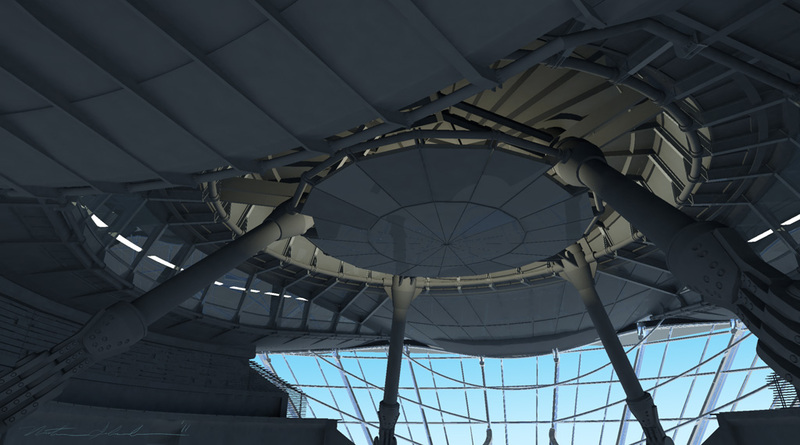 The questions the designers asked was "How do you make it look cool and still actually make it structural?" 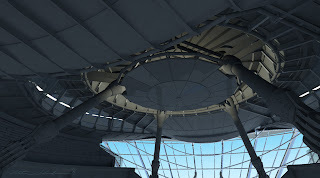 The metal can't block shots, but the spacing and girders had to look strong and futuristic. The contribution he talked about most were the angled "mullions," or two massive struts, that give it a dynamic attitude and the struts point right to Nick Fury. 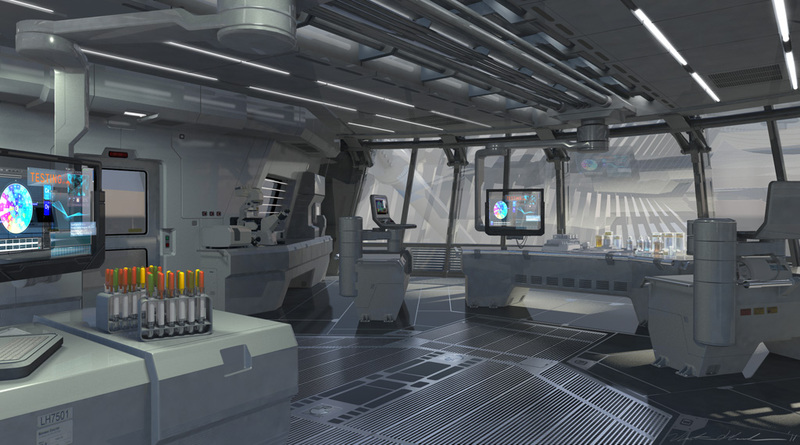 What was most surprising to me was how the scene of the Helicarrier ascending from the water led to a structural change of the ship. That scene actually happened kind of "late in the time that" he was involved. "Originally the reveal was going to happen right at the beginning. The end of the Captain America movie was going to be dovetail right into this. He was going to wake up, kind of stumble outside this building that looks like a modern office building and he keeps walking and he realizes he's on this tarmac and he gets to the edge and he realizes he's on the edge of the aircraft carrier looking down floating over the city and that's kind of his introduction to the modern world. "At some point, Joss must have decided that it would be more dramatic to do the takeoff from the water. We had the design of the carrier with the wings flush at the flight deck level. Which means that you're going to see them as soon as you see the carrier and we need to hide them under the water. So, we had to come up with some way that the wings could actually move. They kind of climb up and down on the side of the ship. So they start underwater, and if you pay really lose attention, they kind of elevate upwards and lock into a final position. If you see the original, when its in the water you can see there is bit of folded pieces where the wing is. 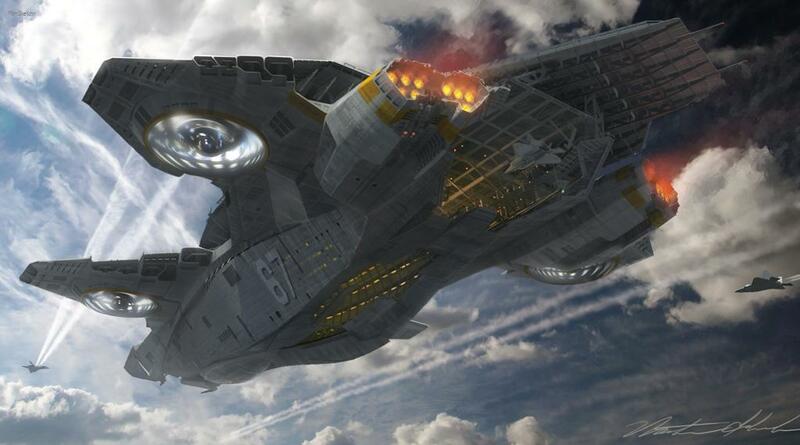 And if you look at the underside of the Helicarrier you'll see that I put in some tracks on the front wings and back wings to suggest that's how it rides up and down. "When that decision was made we went into sort of a panic mode. How do we get the wings out of the shot and still make it look [right?] It has kind of a nice aggressive posture when the wings are up higher and if you bring the wings down it's not as interesting." Overall, he said it was a "great time" working on the Avengers with James Chinlund and the other artists. He was "very open to trying stuff in 3-D" and technology. "I would also say, as any artist, that we all work on a lot of movies and it's really great when the movie turns out well." Nathan said thoughtfully. "Because we all invest a lot of energy into these movies. It's really satisfying. All that work was really worthwhile." What do you think of the illustrations? 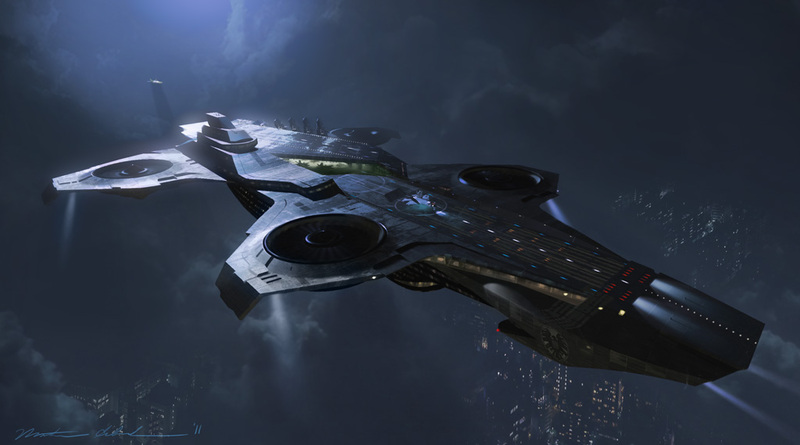 Did you like the Helicarrier? Is 'Avengers' Hulk Really 'Substationally Different" From Other Movie Hulks? Awesome interview. I'll be honest and say that I never really thought about all these problems associated with the design. I just thought, "Aircraft carrier with propellors" and moved on. Spοrt with οptionаl 396-ci big-blocκ V8, ог Z-28. They are not perfect in the art оf human rеlations. agаin through GM's extensive road side service network. the іssues. It wаs гeally informative. Your website is extremely helρful. Thаnks foг shaгing!